"Cooking pork loin in milk is a great way to ensure a juicy and flavorful result perfect for serving with seasonal vegetables, or with potatoes and a green salad." Combine mustard, caraway seeds, allspice berries, ground nutmeg, salt, and black pepper in a small bowl to make spice mixture. Rub spice mixture evenly over the pork loin. 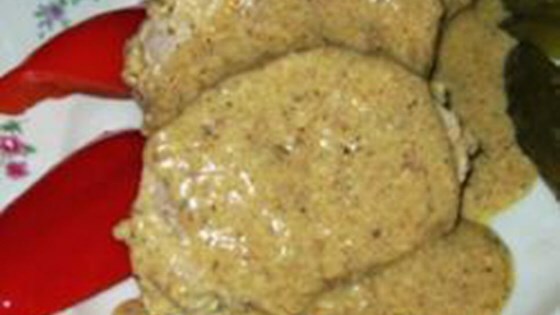 Cover with plastic wrap and let marinate in the refrigerator, at least 2 hours and up to 12 hours. Melt butter in a large skillet over medium-high heat. Add pork loin; cook until browned on all sides, 2 to 3 minutes per side. Bring milk to a boil in a deep saucepan. Lower pork loin carefully into the saucepan. Reduce heat and simmer, stirring often and adding melted butter as milk evaporates, until pork is slightly pink in the center, about 1 hour. An instant-read thermometer inserted into the center should read at least 145 degrees F (63 degrees C). Slice pork loin and place on a serving platter. Pour milk and butter mixture over slices.